“The United States will impose large sanctions on Turkey for their long time detainment of Pastor Andrew Brunson, a great Christian, family man and wonderful human being. He is suffering greatly. This innocent man of faith should be released immediately!” Mr Trump tweeted. Turkish prosecutors accuse Brunson of activities on behalf of the PKK as well as the Gülen group inspired by US-based preacher Fethullah Gülen, accused by the Turkish government of orchestrating a July 2016 coup attempt in Turkey. The group denies any involvement in the putsch. Turkey’s state-run Anadolu news agency said a “secret witness” — described as a former parishioner codenamed “Serhat” — testified via a long-distance system and claimed that Brunson helped Kurdish militants, including those fighting in Syria, in various ways. He also claimed that a Syrian who converted to Christianity had helped Brunson. Brunson, who has lived in Turkey for decades, strongly rejected the claims. “These accusations are shameful and disgusting. There is not one photograph or tape recording praising the PKK at the [Izmir] Resurrection Church. Our church had several Turkish followers. Our doors were open to everyone. I strived to prevent politics from entering the church,” Anadolu quoted Brunson as saying. The indictment against him — based on the testimony of witnesses, including three secret ones, and digital evidence — claims the pastor worked to convert Kurds to Christianity to sow discord in Turkey. He denied all the charges leveled against him during the first hearing last month and from time to time broke down in tears. U.S. Embassy Chargé d’affaires Philip Kosnett and Sandra Jolley, vice chair of the US Commission on International Religious Freedom, were present at the May 7 hearing. The case has further inflamed tensions between NATO allies Turkey and the United States. Trump said the pastor was on trial and being prosecuted for “no reason,” in a tweet after the Turkish court ruled to keep him in jail. “They call him a Spy, but I am more a Spy than he is. 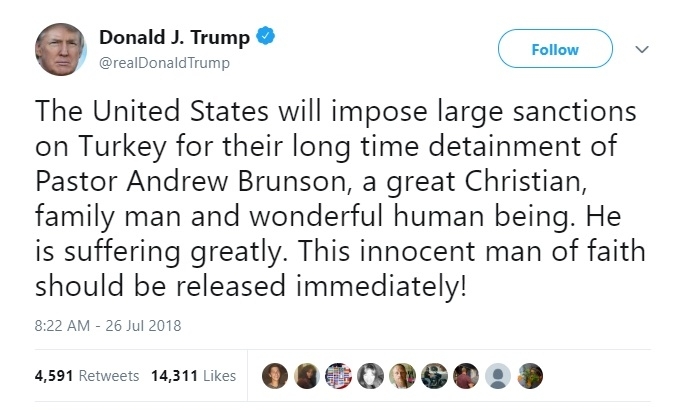 Hopefully he will be allowed to come home to his beautiful family where he belongs!” Trump tweeted. The State Department said it had seen “no credible evidence” that Brunson was guilty of a crime. Foreign Minister Mevlüt Çavuşoğlu, who will soon meet with his US counterpart, Mike Pompeo, in Washington, said Brunson’s case was a legal one. “They say ’the government should release him.’ Is it up to me? This is a decision the judiciary will make,” Çavuşoğlu told broadcaster CNN Türk in an interview on Sunday. The court on Monday ruled to continue Brunson’s pretrial detention and set the next hearing for July 18.